• documents rich experiences of Indian entrepreneurs and their unique entrepreneurial approaches towards management of social enterprises, loss-making firms in the public sector, corporate social responsibility, succession planning, and innovation. The book will prove essential to students and scholars of business, entrepreneurship and management, and entrepreneurs and managers working in MSMEs, especially young entrepreneurs as well as the general reader. Foreword N.V. Vasani. Preface. Acknowledgements. 1. 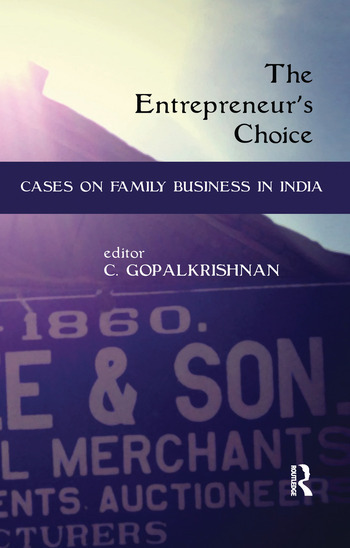 Cases on Entrepreneurs and Family Business in India: An Overview Section I: Values, Mission, Vision and Strategy 2. Prathama Blood Centre: A Revolution in Blood Banking 3. Laxmi Mishthan Bhandar 4. Alcock Cement Pipes and Concrete Works Section II: Environmental Analysis and Resources Analysis 5. Sindhis and the Electronics Trade Community Cluster in Ahmedabad 6. Tamanna Fashions, Kolkata 7. Kamla Travels 8. Citizen Infoline Limited 9. Balaji Wafers Private Limited 10. Vishalla: A Vibrant Village with a Museum and a Unique Restaurant Section III: Stakeholder Expectations 11. The Education of Ram Kumar: When the Fence Starts Eating the Crop 12. Dalal Packaging Section IV: Strategic Options, Strategy Evaluation and Implementation 13. Kanhai Foods Private Limited 14. Brothers’ Foods Private Limited 15. Saturn Engineering Works Private Limited 16. Aava Natural Mineral Water 17. Hester Biosciences Limited 18. Gunjan Paints Limited 19. Rectifiers and Controls 20. Gujarat Tractor Corporation Limited Section V: Management of Organizations with Social Objectives 21. Seva Café: Food for the Soul 22. Calorx and Visamo Kids Foundation 23. Apang Manav Mandal. C. Gopalkrishnan is Director, Institute of Management, Nirma University, Ahmedabad, Gujarat, India.